A couple of family portraits taken during our church directory photo shoot fill 3 of the 5 frames in the arrangement. I hope to have some fun outdoor photos of the kids taken in the fall, but these shots will get some prime real estate for a while. 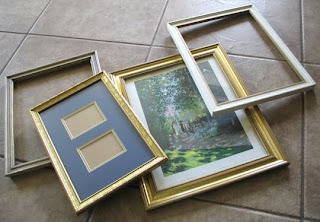 I dug through my stash and found two vintage 80s gold frames, two empty, older wood ones and another medium stained wood frame, not pictured. I love it! 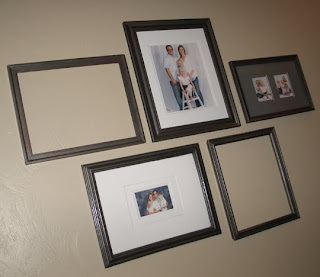 The empty frames are a cool touch; they fill space without cluttering it. I'll have to keep that idea as well as the spray paint one in mind. Thank you for this. I have so many older frames that I have in boxes. 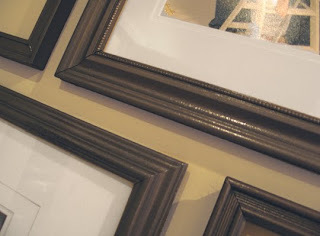 I hate to get rid of frames, but didn't want to hang them up because, well, they're ugly! I will have to paint them and start using them again! Congrats and thanks to giving blood. After having a transfusion during the birth of my first baby I see the greater importance to giving blood. I am past due for my quarterly visit! Thanks for the reminder. Hope it didn't make you too queezy, as for me...I shed tears every time! That was a great idea for all the old frame I like it good that you shared this. Will certainly visit your site more often now.